Welcome. We are here to salute Thomas Paine, a luminous presence in the American Revolution, the birth of the modern world, and a brilliant forerunner of twenty-first century thought. In some schools of physics, the cosmological constant is postulated as that which pervades the entire universe and is not subject to time. Metaphorically, Thomas Paine and the ideas he instantiated represent the modern equivalent of the cosmological constant. Paine represents the quintessential expression, the beacon light of the modern age who expressed a timeless philosophy. For Paine and others, the modern age is built upon the principle of individual reason and collective dialogue for a common good which enables progress towards a universal society. Modern life, supported by basic responsibilities and rights, can transform a community of men and women into active minds seeking self-improvement, self-culture, and a universal, collective ideal which our common sense relies on our with an impersonal spirituality and sound reasoning. Thomas Paine, an Englishman, was born in 1737 and made an income as a stay maker and later as an excise tax collector for the British crown. He witnessed much cruelty and arbitrary injustice in Great Britain which was nationalized by the ‘divine right’ creed of the British monarchy. In his young to middle adulthood, Paine frequented taverns and pubs engaged in political debate where his more radical insights and injustices and his acute rhetorical skills drew praise. He engaged and then met Benjamin Franklin. Brother Franklin encouraged him to go to the American colonies. With an enabling letter of introduction, Paine, traveled steerage class to the Colonies and barely recovered from typhoid fever, spent the better part of 1775, his first year in the New World, writing essays and editing with the encouragement of Franklin, Benjamin Rush, and other colonial radicals in Philadelphia. In 1775, a third of colonial residents wanted compromise with the Mother country, a third chafed for independence, and a third were in an undecided mood. It was the pamphlet Common Sense, which suddenly turned the tide for a great many toward political independence. Paine’s Common Sense set out to inspire colonial subjects not only to support the cause of independence for the colonies, but to inculcate more radical, universal principles that espoused a self-governed republic. Common Sense was the catalyst for transforming colonial subjects into citizens—citizens of a new nation; a United States of America. Paine’s cadenced Common Sense was distributed among the colonies and abroad: “Common Sense for 18 Pence.” The work “burst from the press with an effect which has rarely been produced by any age.” It eventually sold 150,000 copies—one for every twenty people in the colonies. As Joel Barlow observed, “the great American cause owed as much to the pen of Paine as to the sword of Washington.” George Washington described the pamphlet as “working a powerful change in the Minds of Men.” Paine’s pen radically reshaped the way people thought about themselves and transformed the way they related to their government: as colonials not simply to be governed but as destined to be self-governed. Common Sense became the keynote of a modern, self-governing society. The idea that the masses can have the franchise to vote, let alone be self-governing, was a minority view. Yet as Robert Ferguson put it, “Common Sense celebrates an orchestrated solidarity of the right-minded in a new type of participatory, radically democratized republic.” The gradual, if uneven, extension of liberty and universal human rights continues today,and it is viewed as no less radical than it was in 1776! So, What Are the Richer Meanings of “Common Sense” and How Do They Relate to Paine’s Common Sense? Sophia Rosenfeld in her recent volume, A Political History of Common Sense, charts the twists and turns of the concept of “common sense.” The concept has been used in many ways for several centuries. She notes that Thomas Paine had a very unique, revolutionary use of the idea. For example, The Common Sense School of Scottish Philosophy viewed common sense as what fits the norms of the era, the norms of the day. However, Paine’s use of the rubric was different. Rosenfeld writes that Paine viewed common sense as the instant apprehension of plain truth, a heart-felt moral sense which is universal (i.e. common and consistent with natural law); thus men and women can apprehend it as self-evident. From a simple standpoint, common sense can be seen as encouraging us to be non-dogmatic. “Don’t lock into social habit; just use your “common sense”: that flash of what is self-evident, what is right rather than wrong.” Thus all human beings have an innate moral sense which forms the basis of our natural equality. It is the germ of our freedom rooted in insight. 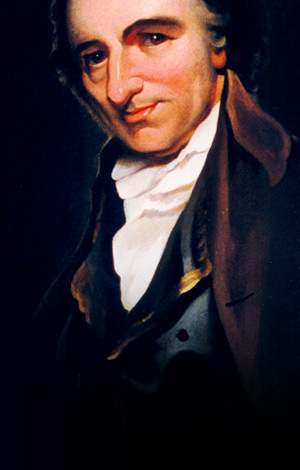 Paine made three references to “common sense” in his pamphlet of that name. Rosenfeld writes that Paine’s sentence that follows his first of three references to common sense focuses on laying out “simple facts, plain arguments, and common sense”. It indicates that the reader is expected to employ his basic, innate sense of truth and goodness to shatter his own complacent, status quo assumptions. Paine’s two subsequent references to common sense makes the case for political independence and that the latter must be examined on the “principles of nature and common sense” rather than habit and tradition. Thus Paine’s use of “common sense” points to a faculty of the mind which we all have rather than simply a set of assumptions by people regarding their shared reality. Everyone has the potential of drawing on their faculty of common sense. One could say it is our natural basis of freedom which is desired by the mind combined with the heart. But just as Martin Luther King pointed to “the long arc of justice” in relation to his “beloved community”, Paine likewise wrote, “The dictates of true common sense are only widely adopted or even revealed over time as mass prejudice, misinformation, and inequity recede.” Paine wrote in another passage: “Perhaps the sentiments contained in the following pages, are not yet sufficiently fashionable to procure them general favor; a long habit of thinking a thing wrong, gives it superficial appearance of being right, and raises at a first a formidable outcry in defense of custom.” Thus, like a stream of water, truth at times rushes above ground, at other times trickles, and sometimes is submerged underground but is never lost. In sum, Paine suggests that there is a unique faculty of our mind, an immediate, higher intuitive form of perception available to all humans which is universal; a source of self-evident knowledge derived from this commonly shared human capacity. So, when we make judgments of perception (common sense) conjoined with judgments of inference (reason), there is expressed a clarity of insight which pierces artificial social conditioning and moves it toward justice. In times of crises, these primary truths when apprehended can be brought to light against the social and moral failures of social conventions. In essence, human beings have an innate “moral sense” based on natural law which leads man to act benevolently and recognizes his fundamental interdependence—the common good. Yet this faculty of mind is ignored by many modern psychologists. What Ever Happened to True Common Sense? In 1736, in a popular farce entitled “Pawsquin”, written by the great English playwright, Henry Fielding, announced the untimely end of one Queen Common Sense, the erstwhile ruler of the world. Her murder, as Fielding explained it, was the product of a conspiracy that went to the very heart of modern life: she had been done in by the combined forces of religion, medicine, and law. But in Fielding’s telling, this disappearance came with a twist. For common sense promised to haunt the future. In her new apparitional form, she would—like many of the great forces in history—be invisible to the naked eye, at least on a regular basis. Yet, she would be impossible to ignore. Today, it is impossible to ignore the need for Paine’s Common Sense in the world and in our republic of conscience!